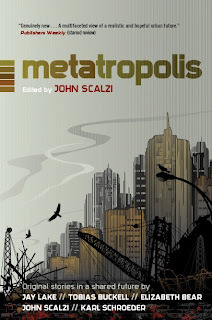 Metatropolis is one of only a few anthologies I have ever read where it is hard to pick a favorite story as most were superb. Five of the brightest voices working in Science Fiction today have come together to create a shared future focusing on cities, which was originally envisioned as a audio only piece for audible.com. Included are stories from Jay Lake, Tobias Buckell, Elizabeth Bear, Karl Schroeder, and John Scalzi who also edited the whole project. Scalzi has done something I don't think has been done before: created a shared world which all of the contributors helped develop and sometimes working in unison sharing their stories with one another as they were writing so things tied-in together as best as possible. Nearly every story is a winner and stands alone in its own right yet together they build a tapestry world where nations have toppled and communities are organized loosely as city-states with anarchy reigning most other places. Metatropolis is about as Green Punk as it can get with its zero-footprint enclaves and green fanatic cults. It is even more so Green Punk than Bacigalupi's The Windup Girl, plus it is a bit more approachable and not so desolate. Jay Lake starts off the anthology with In the Forest of the Night. Lake's story is placed in Cascadiopolis, which is a anarchistic closed-collective in the wilds between Seattle and Vancouver. This was the bleakest story of the bunch. Even though this group of people has advanced technology they are still distrusting of outsiders. Two newcomers get into the city and cause havoc. Green leaves you guessing a lot up until the end. The pacing was very slow and I wanted some more backstory for a few characters, but given the structure I understand why they weren't included. Tobias Buckell's story Stochastic-City is next placed in a run down Detroit, which gives you a broader view of how the world of Metatropolis came about mixing in some of the events that culminated in the downfall of society. 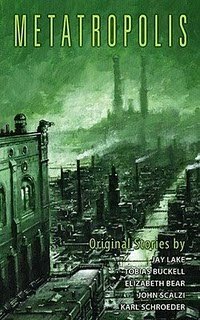 Buckell's story focuses on a future Detroit where a movement to remove cars from the city is taking hold of the populace who are not necessarily for it. Sort of a forced greening of a city. This story easily had my favorite main character who goes to great lengths to get what he thinks he deserves only to find a direction for his life. This was my first taste of Buckell's writing and it has made me eager to finally crack his novel Crystal Rain, which I hope to get to in the near future. Elizabeth Bear's contribution is The Red in the Sky is Our Blood, which follows Buckell's setting in Detroit, but takes a very different tact for a similar goal. One running theme in all the stories is people trying to live through each day without thinking about tomorrow and finding a purpose. I enjoyed Bear's story, but found it difficult to connect with the protagonist Cadie, but that was as designed in many ways. John Scalzi story is the Latin titled Utere Nihil Non Extra Quiritationem Suis , which if I shared the translation would ruin part of the joke to the funniest story in the anthology. 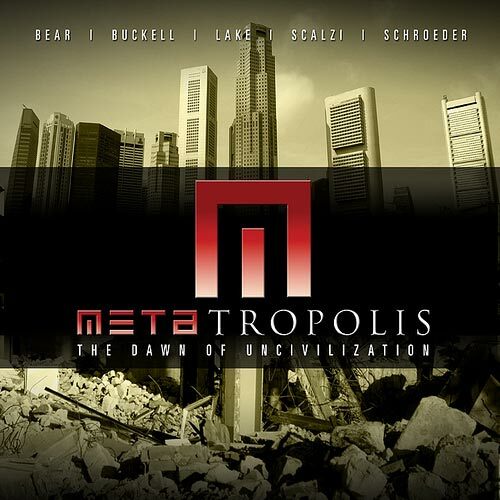 Unlike the other stories Scazli focused on a main character who grew up in a closed cities and who doesn't understand what life was like before society changed and does not appreciate what the world outside safe cities has become. Benji ends up taking a very low level job under threat of expulsion from New St. Louis as everyone must contribute to the betterment of the city in some fashion. Benji is a character drawn to be disliked, but in the end he becomes endearing and finds his place in the world even if it smells funny. Karl Schroeder finish the book strong with the most meta story in the bunch with To Hie From Far Cilenia. It involves steampunk and a cyber world experience similar to that of Snow Crash, but more enmeshed in reality. Yet it oddly reminds me of The City & The City with worlds beyond worlds and a detective like format of an agent in search of something and finding more than he ever thought existed. Really well done. My biggest disappointment was it was over before I was ready to leave and that we only saw one story outside of North America. I give Metatropolis 8 out of 10 hats. This definitely ranks among the best anthologies of the year now. Longer works could certainly be made from what they have and there are a lot more cities to visit and stories to tell in the world of Metatropolis. Sub Press's did the limited edition hardcover release which I read with a trade hardcover recently released from Tor. It was recently announced that there will be a second Metatropolis volume. This time Jay Lake is taking editing duties with all stories being placed in his Cascadia. 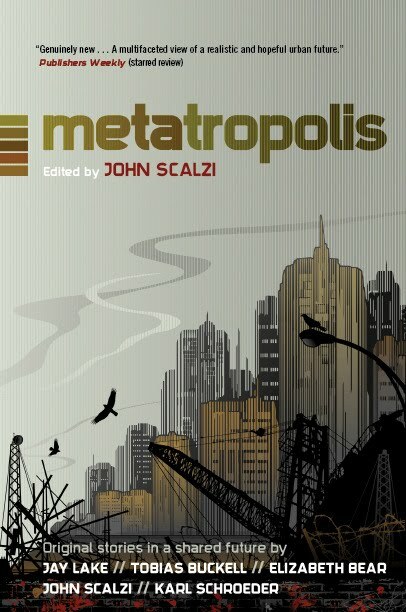 It will be called Metatropolis: Cascadia and will contain stories by the returning Jay Lake, Tobias S. Buckell; Elizabeth Bear; Karl Schroeder; and newbies to the world Ken Scholes and Mary Robinette Kowal. Now that is quite a lineup. Also, the audio version will be narrated by various Star Trek cast members. I would have preferred to see another book from different cities around the world again instead of one locale, but the lineup more than makes up for it.